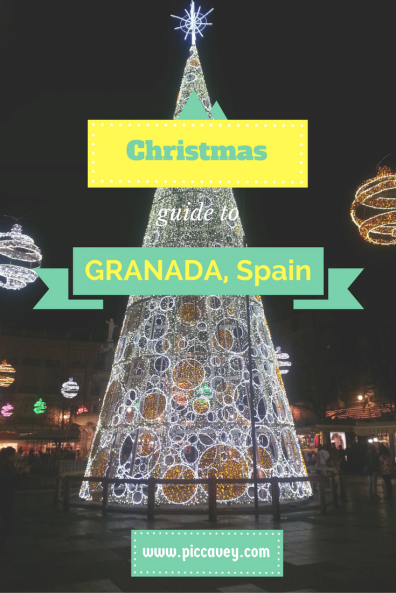 Granada Christmas festivities begin around the 1st of December and end on the 6th of January. Spanish tradition actually celebrates Epiphany with the three kings bringing gifts on January the 6th. 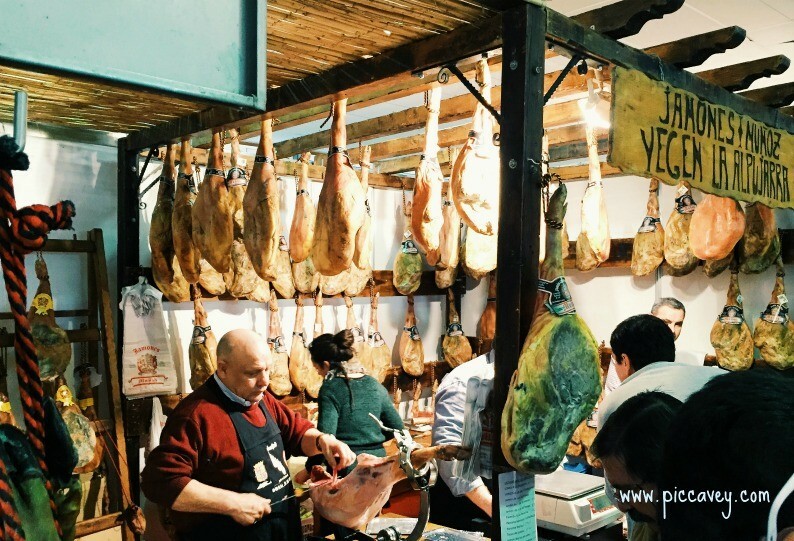 So the Spanish Navidad has plenty to offer with a whole month of activities. Timeless traditions, delicious food and lots of light and colour. Hope you enjoy it and find it useful! 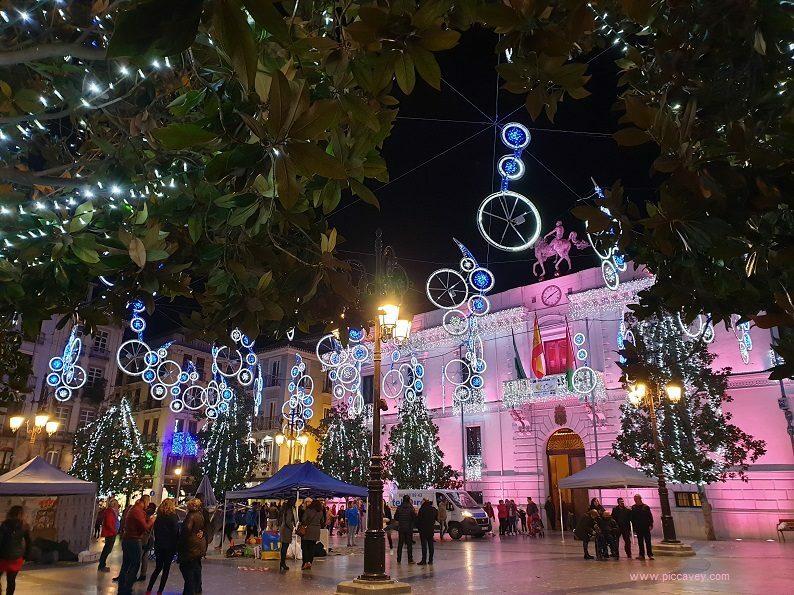 On Tuesday 5th December 2017 in Bib Rambla Square the city Christmas lights will be switched on. The big switch on will be at 6.45pm once it is dark. The new addition this year is an enormous figure of Santa Claus, measuring 6 metres high. 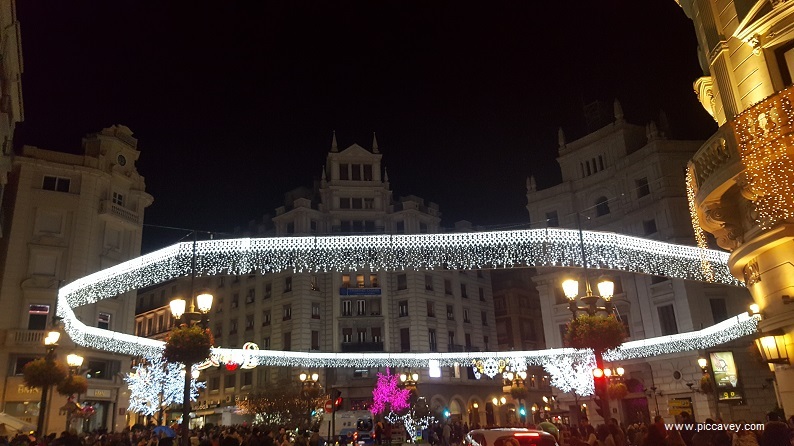 Puerta Real, Gran Via, Reyes Catolicos and the main commercial streets in the city centre are where the most lights are visible. In the UK and Nordic countries, the switching on of Christmas tree lights is usually an important event. In Granada, the Nativity Scene is the main feature in most shop windows and offices. Christmas trees are not quite as abundant as in other countries. In the official Belen competition run by the local town hall around 40 organisations compete. However there are actually many more unofficial displays around the city. 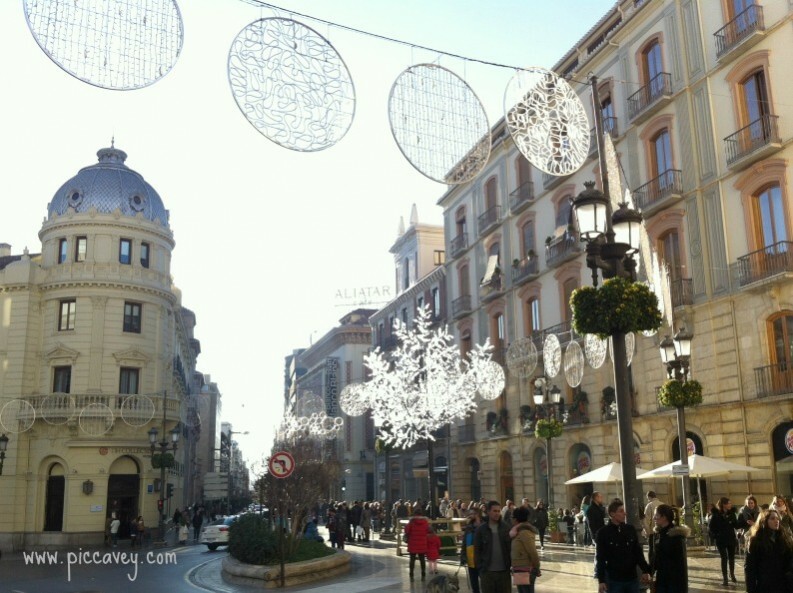 Every year in Granada has a Ruta de Belenes so you can visit all the nativity scenes. All the scenes on the route are open from 11th December until the 5th January. Granada Town Hall. Set inside the inner patio of the Ayuntamiento at the Plaza del Carmen. Open from 10am-2pm & 5pm-9pm 16th Dec until 5th January. Angel Custodio at Calle San Anton 38 from 6pm-9pm. Holidays open from 11.30-2pm. 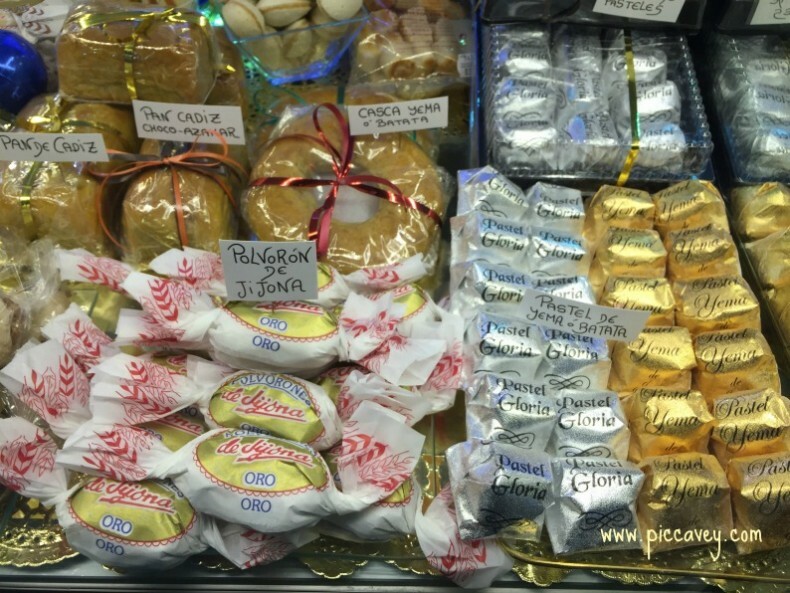 At this Nativity display they also sell traditional Christmas bakes too. Casa Jaen at Calle Jardines 13 has a large nativity scene inside their courtyard. San Rafael Church on Calle San Juan de Dios open from 12th Dec to 6th January from 10,30am to 1.30pm and 5.30pm to 8.30pm daily. Alberto Sanchez Nativity Scene in Pinos Puente. Address: Calle Redonda 24. This amazing set up has been going more than 25 years. Open from 1st December until 6th January 11.30 til 1.30pm & 4.30pm until 8pm. Trevelez, Alpujarra. This village has a Nativity scene based on local traditions. Find it on Calle Carcel next to San AntonionHermitage. Open from 11am-10pm every day. 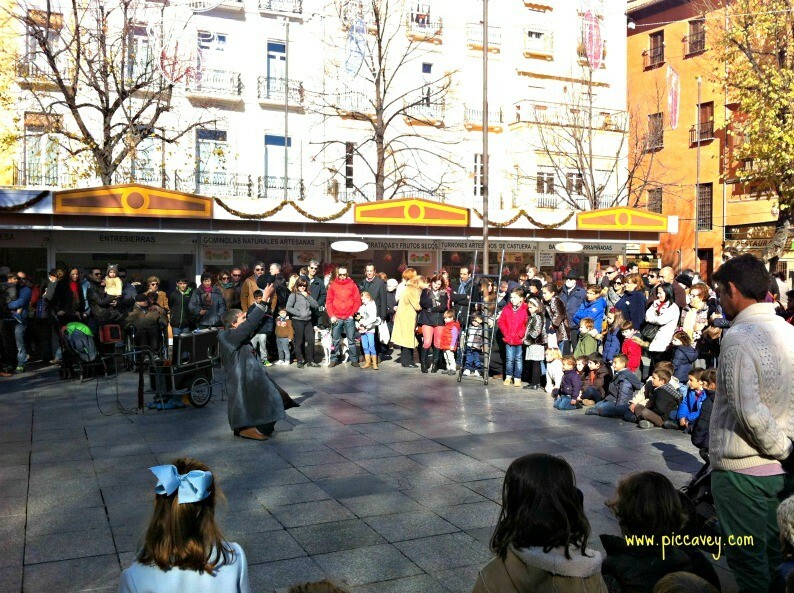 Huétor Tajar has a nativity scene at Plaza Gregorio Peláez until 8th January. Open from 4pm-8pm daily. Do keep an eye out for signs that say Belen as some set up their own in a garage or small business. In Plaza Bib Rambla and Puerta Real the Christmas Markets start on Saturday 2nd December 2017. Open from 11am to 2pm and 5pm to 9.30pm daily. 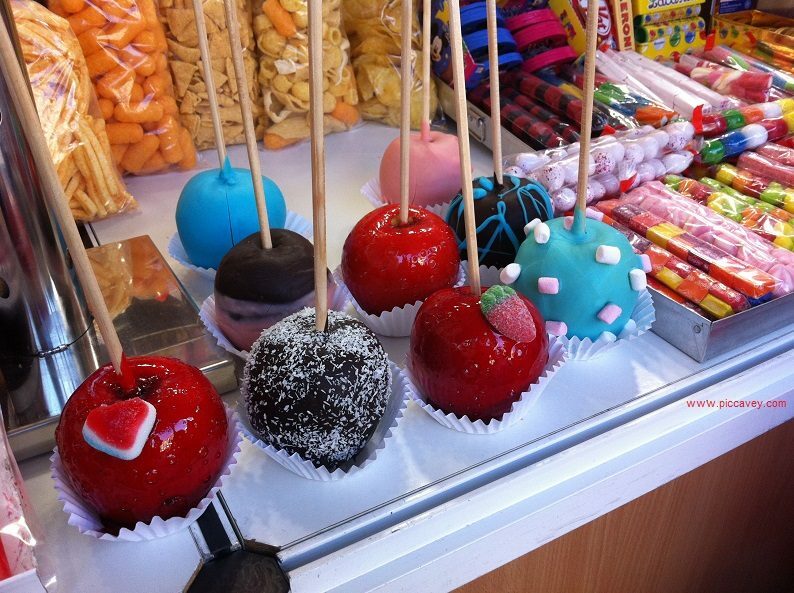 Expect to find typical sweets, handmade toys and jewellery. The stalls are closed on 25th December and 1st January. 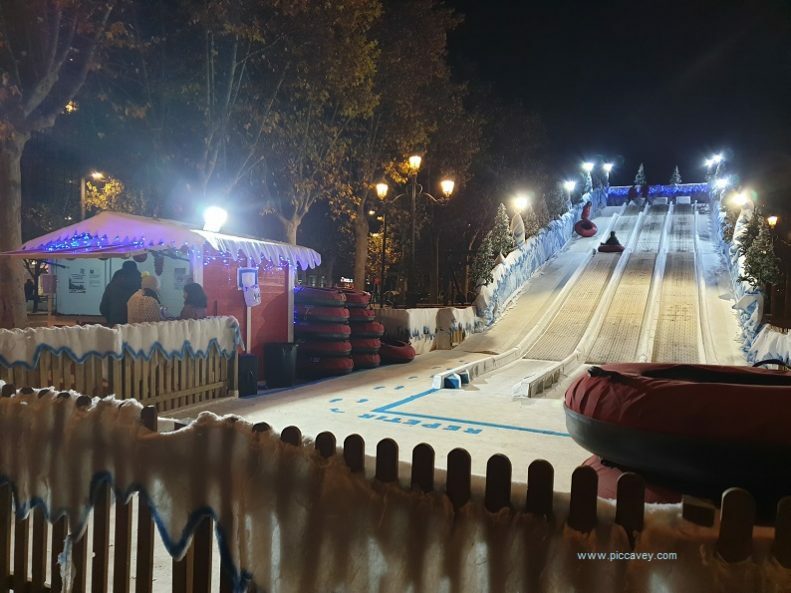 As last year on the Paseo del Salon next to the river there is a Huge Slide. The tobaggan style inflatable is open from 8th December until 8th January 2017. Opening Times are 10am to 2pm and 4pm to 9pm. 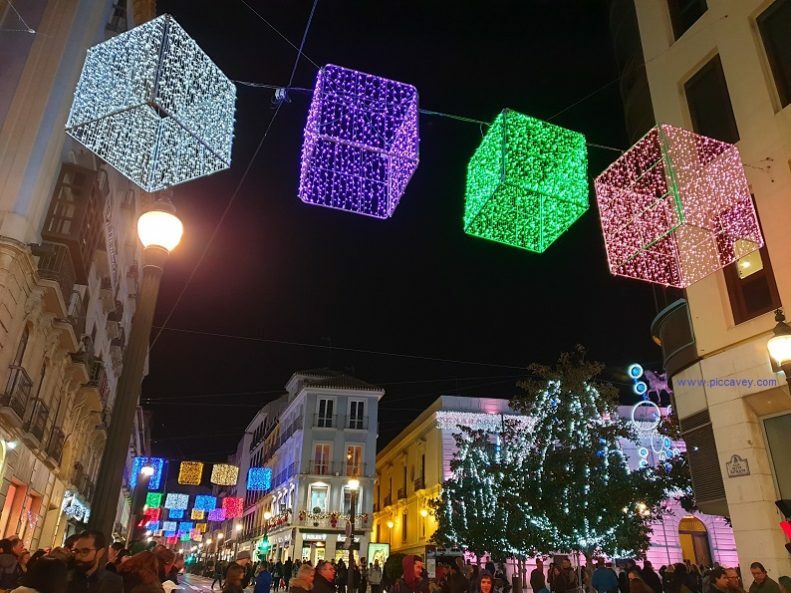 Dont miss Bib Rambla Square as there are lots of Granada Christmas activities usually going on here. Little ones may enjoy visting the Cartero Real at Granada Town Hall. (plaza del Carmen) Its the Spanish equivalent to Santa´s Grotto. One of the three kings is ready to accept your Christmas List from 20th December until 4th Jan.
Ice Skating is another activity that youngsters might enjoy. Don Patin has public sessions for just 5 euros. You need to take gloves with you and warm comforable clothes. Can get the on the Metro to Palacio de Deportes or by bus on 4 route. The Spanish celebrate Christmas eating lots of Shellfish. The main meal on Christmas Eve is often turkey or lamb. Sweets are typical too, particularly Marzipan figures and lots of almond nougat which they call turron. Restaurants and bars will be open over the Christmas period continually. It is recommendable to book on special dates or if you are a group of 4 or more. Christmas Day: Bars and Restaurants are open all day as normal. 31st December – Bars & restaurants are open all day until 5pm-6pm. New Years Eve, For evening meals, only available when pre booked. Many places will be closed. 1st January – New Years Day many will be closed at midday. Opening times in wintertime are Monday to Sunday from 8.30am to 2pm and 2pm to 6pm. The ticket office is open from 8am to 5pm. The Alhambra is closed on 25th December 2018 and 1st January 2019. 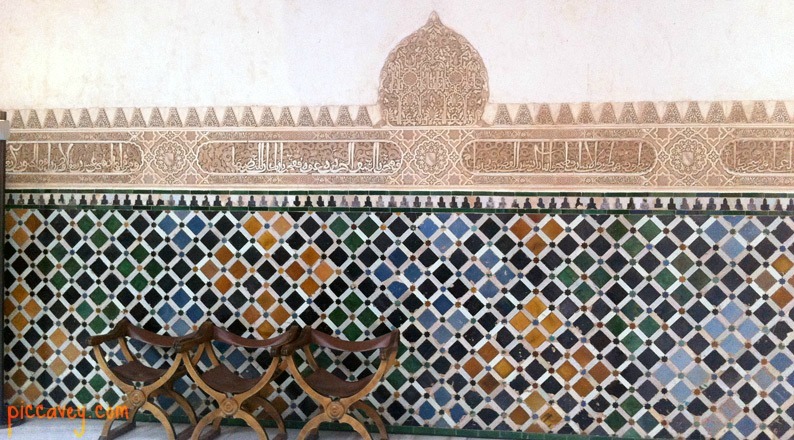 Tickets to visit the Alhambra palace are already sold out on some of the days near the Christmas holidays. If you would like to visit around this time, book as soon as you can. 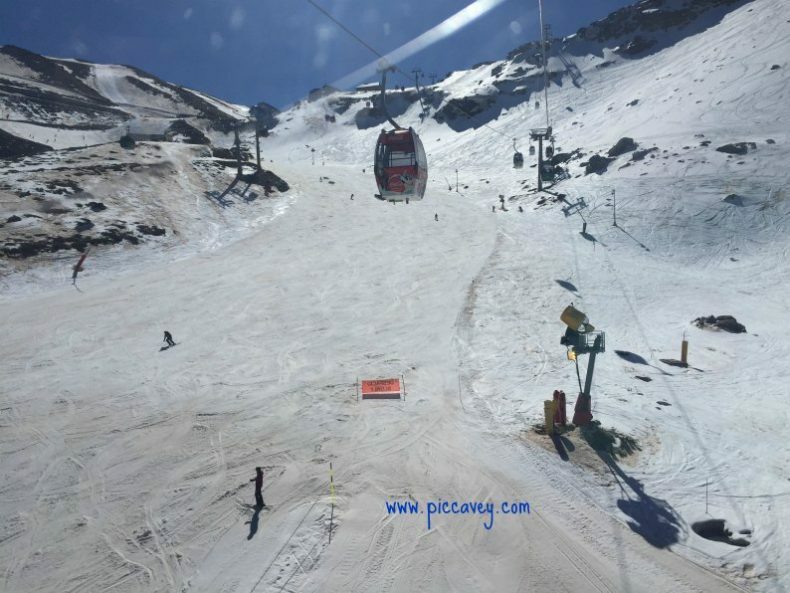 From November until Mid April 2019 Sierra Nevada Ski Station is open. Choose to stay there or just head up on a day trip from the city. If you choose to drive up check road conditions as some parts of the mountain road may need Snow Chains when you reach altitude depending on the weather. The official website Cetursa has information in English. AEMET is the Spanish weather service. A typical Granada Christmas in the mountains can be quite cosy and festive being surrounded by snow. 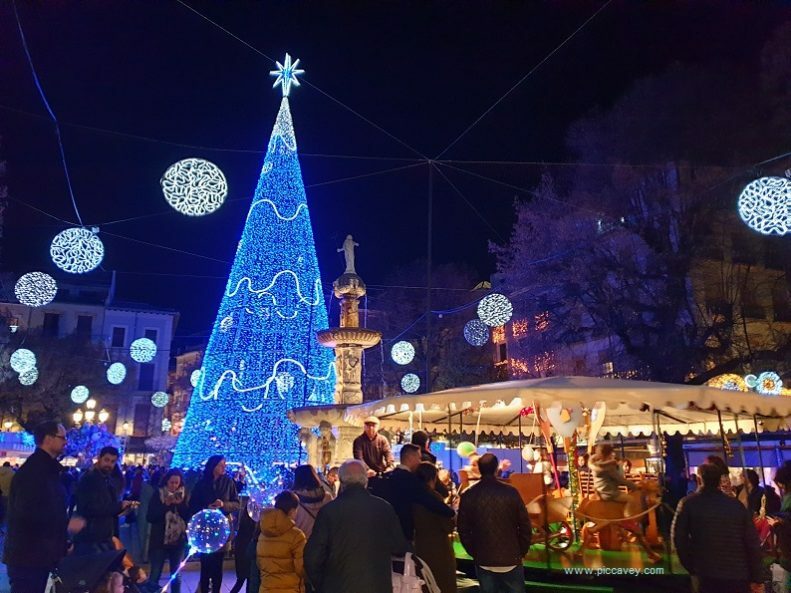 2nd December find Granada Christmas markets in central squares such as Bib Rambla, Puerta Real and other areas dotted around the city. They sell typical sweets, nativity scenes, local crafts and jewellery. 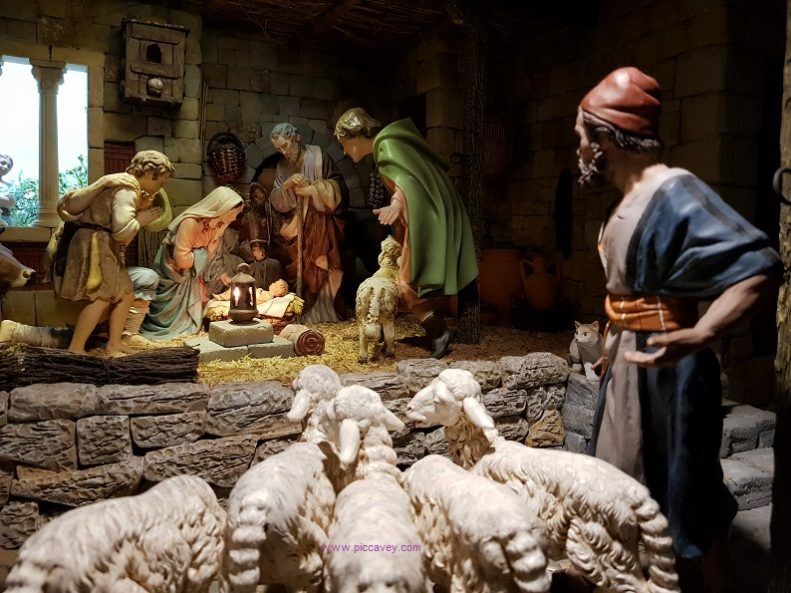 6th December until 5th January The most typical thing for a Granada Christmas is taking a walk around the Nativity Scenes in Granada in Spanish it´s called the Ruta de Belenes. You can see lots of them all around the city. Friday 22nd December 2017 and every year on the Last Friday before Christmas, there is a Nighttime fun run through the streets of Granada. Carrera Nocturna Solidaria. The runners wear costumes. The race begins around 8.30pm. Many roads in and around the edge of the city are closed to traffic from 7.30pm. Bus routes are affected too. On Christmas Eve Spanish families have a special dinner together at home. 25th Christmas Day The Alhambra and other Museums are closed. Bars and Restaurante may open in the evening. 26th December Every year at the Virgen de las Angustias church (close to El Corte Ingles) they hold a special service. This service at 11.45 am is a blessing to thank the Patron of Granada, the Virgen de las Angustias for her protection against earthquakes in Granada. 31st December New Years´Eve It is typical to eat 12 grapes at midnight at Granada town hall. The city puts on a firework or laser show at midnight in Plaza del Carmen. It is usually quite busy. If you go along make sure you wrap up warm. After the New Year has been welcomed in the bars nearby open, usually it will be around 1.30 am. The locals eat with their family and celebrates the chimes at midnight at home. Afterwards they meet their friends to have a drink or party through the night. If you want to eat out on 31st Decem)ber book ahead. Some set menus are quite extravagant on the final day of the year. Look around at what´s on offer a ahead of time and book something you are happy with. At Sierra Nevada ski resort there is a great atmosphere at New Year. Pradallano usually has plenty going on. 1st January is a national holiday in Spain. Take note if you need to get bread, milk etc. Also hardly any restaurants are open on that day. You may find a few open in the evening. 5th January The 3 Kings arrive to Granada and parade through the streets. The route in Granada usually leaves San Juan de Dios around 5.30pm and winds along the whole of Gran Via. The Cabalagata of course is popular with Children and adults alike. As the parade goes by they throw sweets (last year over 10,000kgs of them) out to the crowds. If you intend to fill your pockets with sweets, beware of people next to you with umbrellas and stepladders ; ) as they may have the upper hand. The route is Gran Capitan, San Juan de Dios, Gran Vía de Colón, down along Reyes Católicos past the Town Hall, along to Puerta Real then down to Acera del Darro and onto Carrera de la Virgen. The parade moves onto Plaza del Campillo along Angel Ganivet and concludes on Reyes Católicos. At the end of the Cabalgata at Plaza del Carmen the Spritely figure of Duende Fermin will address the Children and some fireworks are set off from the Town Hall building. Shops are open until midnight on 5th January for last minute purchases. This adds to the hustle and bustle. 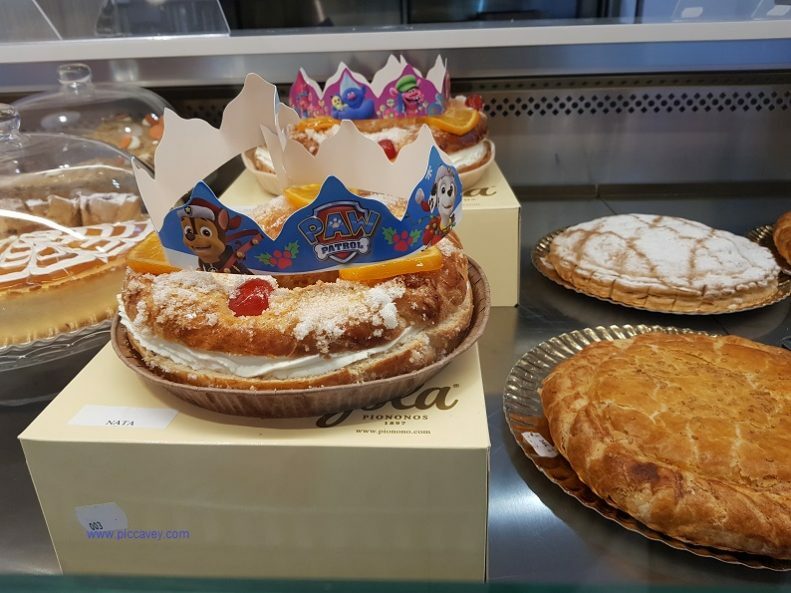 I love the atmosphere and often buy a Roscon de Reyes after seeing the parade so I can have cake for breakfast on the 6th January. 6th January As soon as you wake up open your pressies. The three Kings will have left you gifts during the night of course. Althought you may have been left sweet black coal if you were naughty this year. 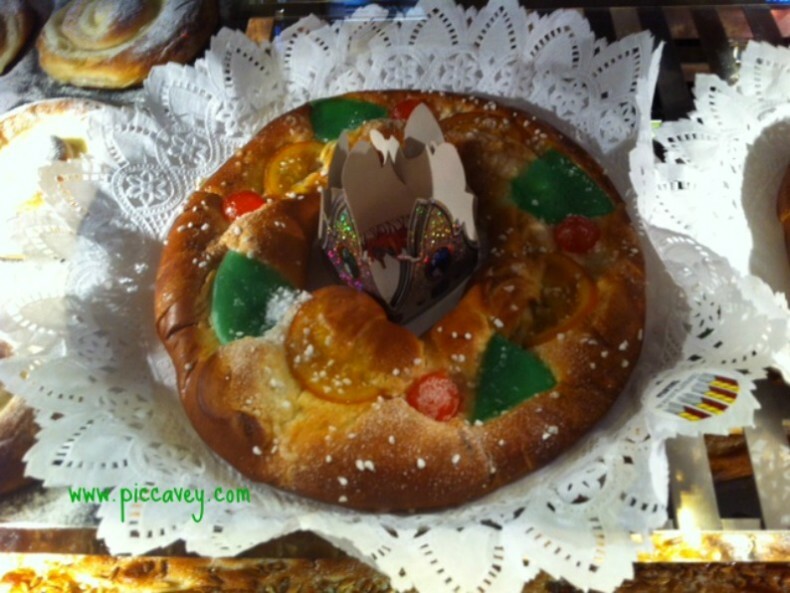 At lunchtime have food fit for a King followed by the typical dessert, Roscon de Reyes. 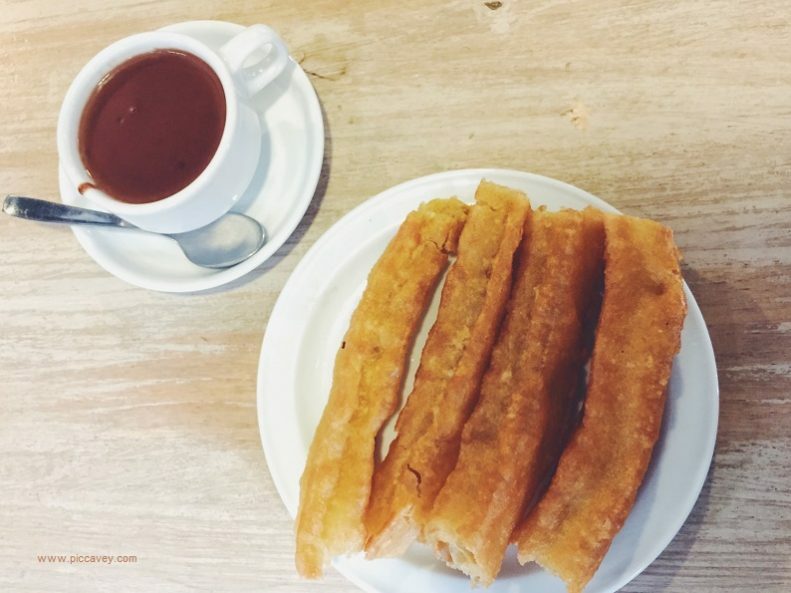 This is one of my favourite festival foods of the whole of the Spanish calendar. A light brioche style mix baked into a ring shape. Then it is covered with candied fruit and sugar. It may be filled with White cream (nata) or yellow creme patissiere (crema). Some modern variations are truffle or chocolate flavoured fillings. But more than the filling what you need to watch out for is the Spanish answer to the sixpence or threepenny bit in the Christmas pud. Here they have La haba. A dried broad bean carefully hidden inside the Roscon. If you get this in your portion you´ll have to pay for the whole cake. Of course there is a King inside the cake too and the one who gets the King gets to wear the paper Golden Crown and is named the King. Some families request more than one King to avoid squabbles at the table. 7th January Things get back to normal again. The January sales begin on the 7th January in stores. It is the first working day after the Christmas holidays. 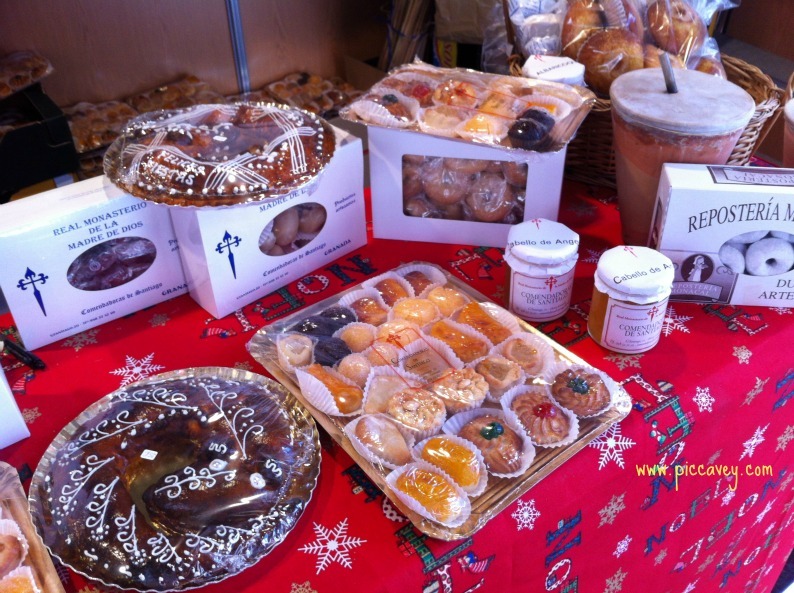 Polverones y mantecados – Typical Christmas sweets Mantecados made from lard (manteca) are made from ground almonds. Warning make sure you have a drink of some sort nearby when tasting these, polvorones are powdery and can be dry. Cabalgata – The 3 kings parade held on 5th January. Hi! I’m trying to search for info on the fun run, but no luck. Do you have a link? We look forward to coming to you for Christmas when we can. See you soon. You will need to call to book ahead (or send an email) to make a reservation. Do Restaurant’s and Bar’s open on 6th January 2018 in Granada. Hi we are coming to Granada for a couple of days over December . We are bringing our two golden retrievers. We are used to sitting outside with them, hopefully in a canopy. As it’s colder here do restaurants and bars still have this facility or does everyone eat indoors! We know how the Spanish don’t let dogs indoors . As Smokers are not allowed inside usually the smoking clients have outside tables. We will be spending Christmas eve/day in Granada. We would love to attend a Christmas eve service at one of the Cathedrals. Do they have services on Christmas eve like in the US? Any thoughts/suggestions? 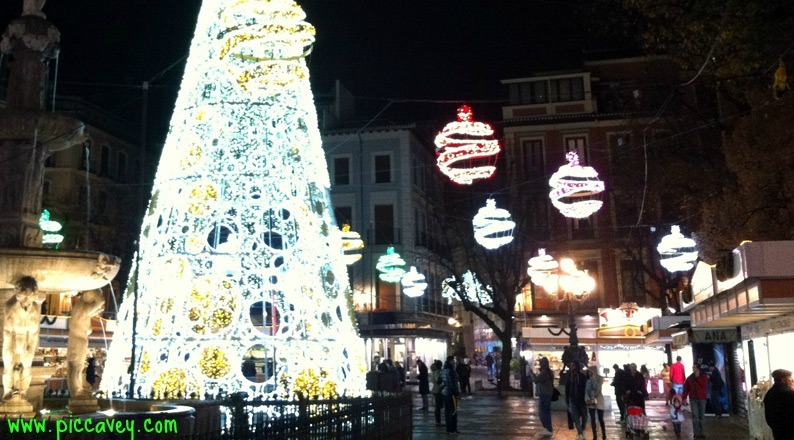 On Christmas Even there are several services in the city of Granada. The Cathedral, The Virgen of Angustias church and the Sacromonte Abbey all begin at midnight. other options are the iglesia de San Francisco, San Antón, San Jerómino or Iglesia de Santo Domingo.